Karnataka State Government has providing Land Records details online, The Revenue Department in Karnataka, with the technical assistance from National Informatics Centre (NIC), Bangalore, has built and operationalised the BHOOMI ( http://bhoomi.karnataka.gov.in/ ) system throughout the state.Bhoomi (meaning land) is the project of on-line delivery and management of land records in Karnataka. It provides transparency in land records management with better citizen services and takes discretion away from civil servants at operating levels.Karnatka Citizens avail this web portal for Check their Land Records details (View RTC /Mutation extract /Mutation status / RR5/RR6/Pahani )online. Farmers can now access the database and are empowered to follow up. In the BHOOMI project, a printed copy of the RTC can be obtained online by providing the name of the owner or plot number at computerized land record kiosks in 177 taluk offices, for a fee of Rs.15. A second computer screen faces the clients to enable them to see the transaction being performed. A farmer can check the status of a mutation application on Touch Screen Kiosks. If the revenue inspector does not complete the mutation within 45 days, a farmer can now approach a senior officer person with their griveance. 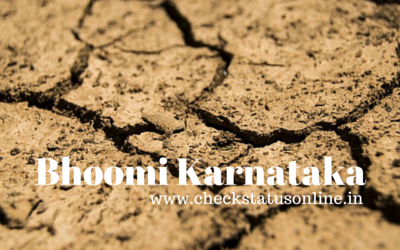 How to check Karnataka Land Record ( RTC/Pahani) Status through Bhoomi Portal ? Step by Step Procedure for obtain Karnataka Land Records online. Click on "View RTC /Mutation extract /Mutation status / RR5/RR6" option on the right side of Web portal. Now Select your District Name in the drop down list and Click on "Submit" Button. Select your Taluka and Clcik on "Submit" Button. Than Select your Village enter your Survey Number and click on "Submit" Button. Finally Get your Land Record Details online.